Meniscus used Twitter for live updates on occasion during the South by Southwest (SXSW) Interactive Conference in Austin, Texas. But for the annual Legg Mason Tennis Classic, we decided to take things further by live tweeting during the singles semifinals and finals. 3:55 p.m.: Meniscus is live at the Legg Mason! Andy Roddick just arrived via an official tournament shuttle, which dropped him off in front of the credentials trailer. 4:10 p.m.: First semi – Fernando Gonzalez (also affectionately known as “Gonzo”) vs. Juan Martin Del Potro (the defending champ). The two are whacking the ball on this humid day. 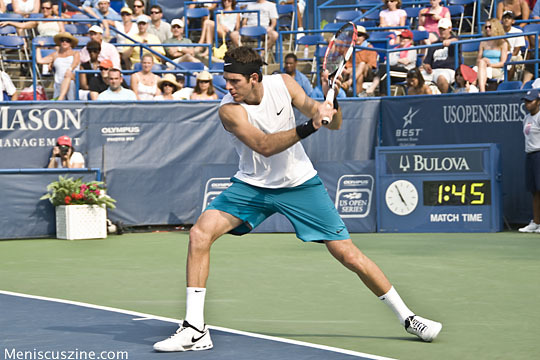 4:30 p.m.: Gonzo had set points but Del Potro takes the first-set breaker. 4:41 p.m.: Ha ha ha, Gonzo fell going for a shot and figured he’d enlist Del Potro’s helping hand by remaining on his back until Juan Martin ambled over the net to pull him up. Crowd loves it. 4:49 p.m.: They are beating the stuffing out of the ball. Del Potro up 3-0 in the second set though. 4:55 p.m.: *sigh* Gonzo is about to get bageled. Lost some steam since the set points. Too bad there is no more free bagel promo. For those of you who remember the Chesapeake Bagel Bakery, the now-defunct former sponsor promised a half-dozen free bagels if a 6-0 set was recorded in a match during the session. Andre Agassi did the honors once when he got shut out in a set against Patrick Rafter; the crowd was grateful, to say the very least. 5:14 p.m.: Gonzo takes three games in a row but loses to Del Potro, 7-6 (7-2), 6-3. Next for the Argentine in the final: Roddick or Isner. 6:49 p.m.: Great to see the Legg Mason Tennis Classic as a US Open Series event. This basically means that it is now one of the marquee American hard court tournaments leading up to the final major of the season, the US Open. In effect, more ranking points and quadruple the prize money. Several of us Meniscus staff members were former Legg Mason volunteers, serving in various capacities as program sellers, ballpersons, tournament office hotline call takers, scorekeepers and hospitality lounge overseers. Diaries from the perspective of one of these roles – you guessed it, a ballkid – are available in hard copies of Meniscus of yesteryear, if you can find them. 7:11:04 p.m.: Roddick and Isner warming up now ahead of second semi. 7:15:06 p.m.: And play has begun! 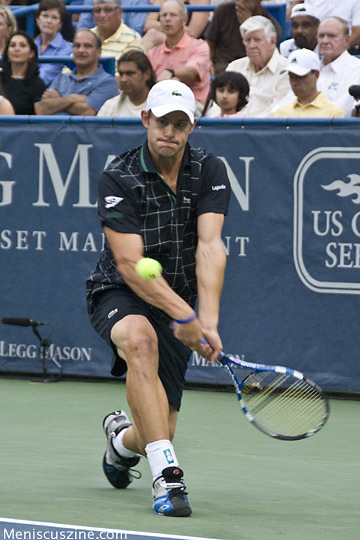 Roddick easily holds to start the match. 7:26:02 p.m.: Overheard in the press area: “Can we just fast forward to the tiebreak?” That said, Roddick staves off two break points. Two big servers currently on serve. 7:46:38 p.m.: Another great semi so far. Roddick zings a crosscourt backhand, Isner counters with a drop shot and winner to close the game. 4-4. 8:02:02 p.m.: We have a tiebreak! But not before Isner saved a set point. 8:08:03 p.m.: Isner wins the first set vs. Roddick! 7-3 in tiebreak. Drop shot to end it. 8:10:13 p.m.: Longtime Legg Mason Tennis Classic announcer Charlie Brotman just told us press folks that it’s a sellout crowd for this Isner-Roddick semifinal. 8:15:19 p.m.: Roddick breaks to open the second set and he pumps his fist. Crowd is clapping in unison. 8:35:07 p.m.: Roddick now up two breaks in the second set…looking at a third! 9:09:12 p.m.: On serve in third set and quality of tennis has not dipped. Great variety of shots from both Isner and Roddick. 9:29:32 p.m.: Andy dives and tumbles going for a shot. (He is asked about this later in the televised post-match interview, referring to the injury sustained at Wimbledon where he narrowly lost a tight five-setter to Roger Federer. Andy says that he is more concerned about the condition of the court as a result of his tumble rather than himself, drawing laughs.) There are shouts of “one more point” from the crowd but an arithmetic lesson is sorely needed – it’s deuce. Come on, people. 9:41:02 p.m.: Roddick breaks! He serves for the match at 6-5 in the third set. 9:44:07 p.m.: We will have a Roddick-Del Potro final! Andy beats John Isner, 6-7 (3), 6-2, 7-5. 9:50:05 p.m.: The 6’9”, 24-year-old Isner after the match: “He (Roddick) broke me down at 5-all.” He and Roddick are doing a JOINT interview on ESPN2 with Patrick McEnroe and Darren Cahill outside the stadium while fans gather around to watch. The three-setter ended up being a 2.5-hour match. To follow Meniscus on Twitter, go to http://twitter.com/meniscuszine, which includes alerts to our latest news, live event coverage, retweets of links that we find to be interesting and all sorts of other stuff.